There’s something spellbinding about the Moon 240i. 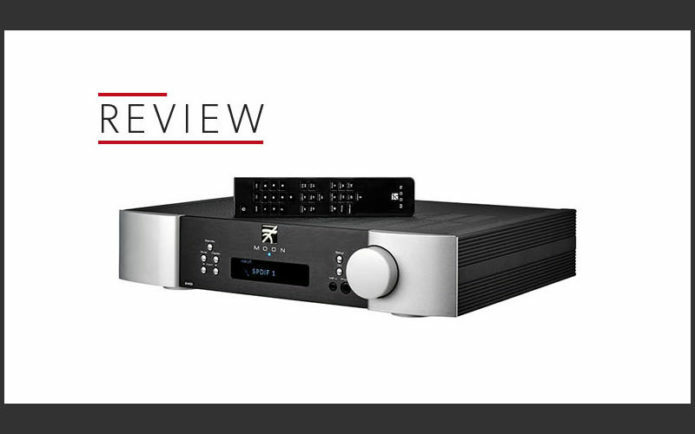 It’s Moon’s latest entry-level integrated amplifier (‘entry-level’ being the very thick end of £2000 to a company such as Moon), but it has the performance and looks of something far pricier. After running it in overnight, we start off by playing Tom Waits’ Alice on vinyl, and are immediately alerted to the Moon’s talents. Waits’ characteristically raspy tone is packed with layers of detail, but it’s mixed with more delicacy and subtlety than we usually hear at this level. Even his overly gruff singing in No One Knows I’m Gone comes across as more refined through the Moon, without it sacrificing the solidity or depth of his singing. The song sounds just a little more bittersweet as a result. Elsewhere, the muted trumpet on Alice sounds almost unearthly, and the bass notes have a twang to them that is often overlooked by all bar the very best amps – particularly those with a few more zeros on the price tag than this Moon. The 240i is surprisingly revealing. What we’re pleased by is how it doesn’t go about making jazz-hands about this fact. This is an understated, yet terrifically talented, amplifier – one that puts subtlety and dynamism to the fore. From the metronomic ticking to the contradictory feeling of vast, echoey space and claustrophobic tension in Hans Zimmer’s Coward, the Moon effortlessly lays bare the subtle sounds and slow build-up of tension as the composition intensifies. We play some of our tricker test tracks, including Radiohead’s 15 Step and The Dead Weather’s 60 Feet Tall, and the Moon remains unflappable. Its sense of timing is agile and precise, and all instrumental strands are pulled taut and are well organised. The edges of notes are crisp and definite, silences are as deep as chasms, and the solidity of a drum hit or a guitar strum is deeply satisfying. If you favour all-out muscle and attack, however, this may not be the amplifier for you. The £1600 Rega Elicit-R’s leaner character is better at delivering the crunchy, distorted guitars of Marilyn Manson’s Killing Strangers and has a little more bite and attitude with songs that need it, such as Eminem’s The Way I Am. The Moon has a smoother presentation, but it doesn’t sacrifice an ounce of detail in being so listenable. What it does best is communicate the spirit of a song faithfully: from the tongue-in-cheek fun of Macklemore’s Thrift Shop to the wistfulness of Elliott Smith’s Say Yes and even the spitting rage behind the Eminem tracks. So we find ourselves drawn towards playing track after track of our music library, simply enjoying the Moon’s captivating sound. What’s more, you don’t have to worry about upsetting your neighbours to enjoy the Moon to its fullest. It’s a rare thing for an amplifier to sound so engaging at quieter volumes. Turning the volume up simply makes it louder – it doesn’t change the sonic character, it never hardens up. It doesn’t even sound like it’s too loud, showing just how clean and distortion-free the Moon’s performance is. And apart from a slight leanness across the digital inputs – the analogue inputs offer a bit more depth and layering – the Moon’s character stays pretty much the same across all its sockets. Although the Moon’s smooth, fluid character makes it easy to pair with a number of products, to fully show off the 240i’s subtleties you’ll need to partner it with some seriously capable kit. The refined and articulate Rega Planar 6 (but with the MM Exact cartridge rather than the MC Ania) works like a dream with the Moon 240i, as does the all-round excellent Clearaudio Concept. Speakers-wise, we’d recommend the expressive, agile talents of the Dynaudio Special Forty standmounts or the Spendor A4 floorstanders as perfect partners. The insides of the 240i aren’t too dissimilar to those of the Moon Neo Ace streaming system we like so much: a class A/B design outputting 50W of power (into 8 ohms), with an asynchronous DAC supporting playback of hi-res files up to an impressive 32-bit/384kHz as well as DSD256 files, so the option is there if you have albums in high hi-res formats. DSD and 32bit audio files can only be played through the amp’s USB type-B input. all other digital files (16- and 24bit) can be played through the 240i’s other four digital inputs. It’s worth bearing in mind the two coaxials support up to 192kHz, while the two optical inputs are limited to 96kHz. So plug in your sources accordingly. The Moon offers a lot of versatility on the digital front. You can connect your laptop, CD player, a streamer (such as Moon’s excellent Neo MiND) and even a TV to the amp. And that’s before you get to the analogue section: two pairs of RCA inputs, a moving-magnet phono stage for turntables, and a 3.5mm input in front for hardwiring portable music players or your smartphone. There’s a 6.3mm jack for plugging in your headphones, too. We really like the look of the Moon 240i. It’s a classy design, with a sturdy metal chassis that has the kind of build quality reserved for products higher up the price range. We admire the curved silver edges and two-tone effect of our review sample – they look understated and smart. There’s an all-black option, too. The OLED display is crisp and clear, with only the crucial information spelled out on the screen. Buttons are responsive, and the volume dial turns smoothly in subtle steps. The included remote – a long, flat wand with flat buttons – could be better designed and isn’t essential to using the amp – but it’s enough easy to use. Delve into the set-up menu using the front panel buttons and you’ll find options to rename inputs, set volume levels and turn the blue LED under the Moon logo off (if it’s distracting you). Simple stuff, and all easy to navigate through. As we said before, there’s something spellbinding about the Moon 240i . We wouldn’t have batted an eyelid had we been told it was closer to three grand in price. It’s a gorgeous piece of kit and, if you have the system worthy of it, we think you’ll be very happy with this Moon in your home. We know we would.